It’s back. America’s favorite midsize crossover is now being released for the 2018 model season, and it’s looking better than ever. Combining the handling and fuel efficiency of a sedan with the utility and power of an SUV, the 2018 Mazda CX-5 is sure making a name for itself on a number of levels. Ready for a fresh set of wheels? Take on the road in the 2018 Mazda CX-5 in Brookfield WI! Performance has always been a notable aspect of Mazda models, and none of that is lost in the 2018 Mazda CX-5. Each trim comes standard with a SKYACTIV®-G 2.5L engine that delivers 187 horsepower and 186 lb-ft of torque along with the intelligent SKYACTIV-VEHICLE DYNAMICS with G-Vectoring Control. Despite the power range, the Mazda CX-5 still manages to get a steady 25 city/31 hwy mpg. Built for the true thrill-seeker, you’ll never run out of adventures in the Mazda CX-5. We know that everyone is different, so why build a vehicle that doesn’t offer options? 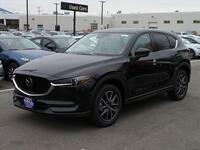 Depending on what you’re looking for, there is a Mazda CX-5 to fit your needs. First up is the Sport trim, which comes in at an MSRP of just $24,150. Even though it’s the base trim, it still offers intelligent features such as a MAZDA CONNECT Infotainment System, rearview camera and Advanced Blind Spot Monitoring with Rear Cross Traffic Alert. Next up is the Touring trim, which is a little more expensive than the Sport but offers more features such as heated front seats and Dual-Zone Automatic Climate Control. Drivers may appreciate these features in the dead of winter when the temperature falls below zero degrees. The highest Mazda CX-5 trim level is the Grand Touring, which offers all the features of the first two trims in addition to smart technology like Power Rear Liftgate, a Mazda Navigation System and a Bose® 10-speaker audio system. Find your fit in one of these trim levels and then get in touch with us here at Hall Mazda in Brookfield! We will set you up with one of our team members who will help you find what you’re looking for while ensuring you don’t run over your budget. Give us a call or stop by today to see what’s waiting for you!